Surpass now includes a selection of sounds you can use for various circulation functions, prompts, and alerts. Selecting and importing sounds from the Settings tab in Circulation Transactions has been simplified. 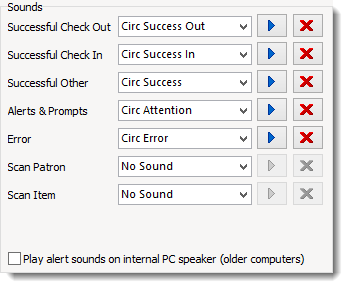 Just select from the drop-down list of pre-loaded sounds or click the Import button to import sounds from the Windows sounds folder. Available now in Surpass 7.40 on SurpassSupport.com. Surpass Hosting Service clients will be updated to Surpass 7.40 on the weekend of May 9.